From the greatest name in foreign language dictionaries Cassell's French & English Dictionary For fast, easy reference and comprehensive listings, Cassell's French & English Dictionary is unbeatable. With over 55,000 entries covering daily conversation as well as technical and professional terms, this handy pocket-sized dictionary is all you need while traveling, studying, or tracking down meanings. Thousands of words, phrases, and idioms in everyday usage are included for maximum up-to-date reference, along with tables of regular and irregular verbs and a pronunciation guide for flexible, correct communication. Cassell's French & English Dictionary is legible and easy to read. It provides faster references for meanings and spellings and simpler access to complete information. 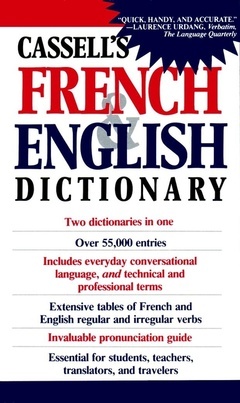 This invaluable volume backed by the world's foremost authorities is the best pocket-sized guide to the French language available.